Please take a moment, before filling out your child's application, to review all of the material in detail. All Co-operative parental expectations and obligations are outlined in the Parent Orientation Handbook. OneList Bruce County is an online child care application system that simplifies the process of finding and applying for child care. Kin-Huron Integrated Day-Nursery School Co-operative, Inc. was formed in August 1984, in Kincardine Ontario, by a group of parents wishing to establish a non-profit, participating, co-operative nursery school with consistent, quality programming with an integrated program for special needs children. KIDS Co-op is licensed through the Ontario Ministry of Education and works closely with Bruce County Social Services to provide training and resources for our teachers as well as the school. The school is managed by a volunteer Board of Directors, who are responsible for the day-to-day business aspects of the school. We strive to be the best program we can be by creating a successful emergent curriculum, while consistently supporting children's development & modeling openness and acceptance to all areas of diversity. Our staff will ensure that they create secure attachments with the children & their families, while always enforcing a safe and secure environment for the children to explore & make discoveries in. 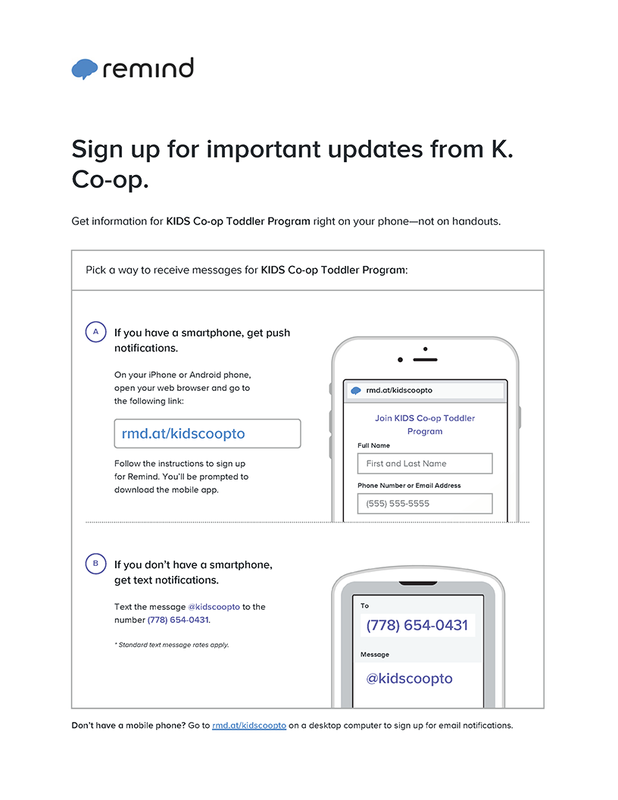 What really makes KIDS Co-op a co-operative? Participation is the cornerstone of the quality experiences that a co-operative nursery school can provide for you and your child. Without your involvement the co-operative would be just another school. It is this special commitment by you that will make the difference in your child's first school experience. Families are asked to participate in , organized fundraisers and bring in donations from the wish list throughout the year. We also ask that parents who are able to attend and help with class parties, field trips and special events. Parent's are encouraged to attend the Annual General Meeting in September and consider joining the board of directors. All of these forms of participation contribute to ensure the school's success. Thank you to all of the families for your support and participation! We are a non-profit, parent - directed, licensed preschool serving Kincardine and area families since 1984. © 2018 Kids Co-Op. All Rights Reserved.